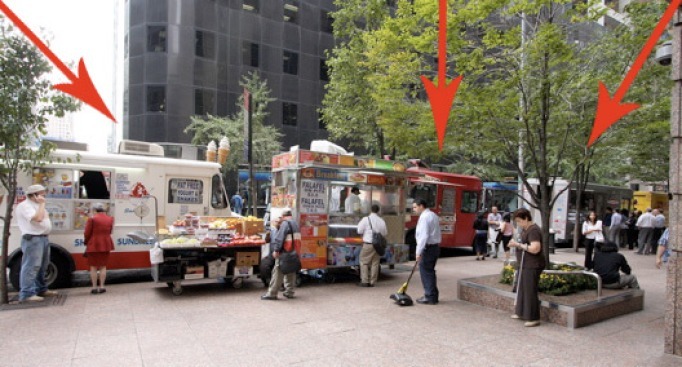 Midtown: It is by no means news that Midtown has had an insurgence of food trucks recently. Ever since operations like Dessert Truck, Treats Truck, and Wafels & Dinges realized there was a much bigger lunchtime market in the 40's than in Soho and the Village, Midtown has been the mobile food epicenter. That said, with the Rickshaw truck joining the fray, we have a veritable truck row (with a fruit stand and food cart thrown in for good measure) on 45th and 6th. We have a feeling this isn't the end of it.